Vanity Planet Blend Party Set of 10 Oval Makeup Brushes, Pucker-up Pink | What Should I Say? Meet your new favorite makeup brushes. 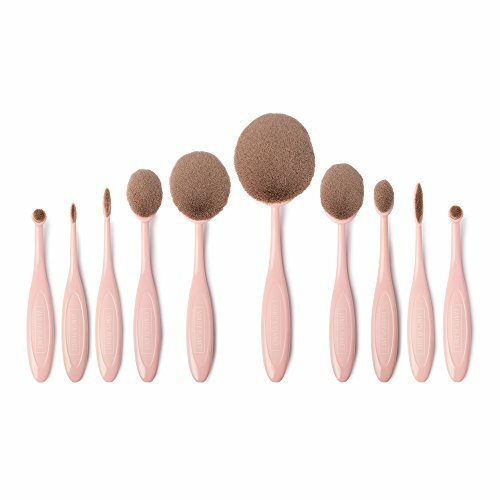 The Vanity Planet Blend Party Set of 10 Oval Makeup Brushes is a complete set of 100% cruelty-free innovative makeup tools that will totally change the way you currently apply your makeup. Traditional makeup brushes were designed with makeup artists in mind, so that style and shape is best suited for applying makeup on other people. But the Vanity Planet Blend Party Set of 10 Oval Makeup Brushes was created with the user in mind – so every feature of the brush is meant to deliver a comfortable, flawless, streak-free application every time. Each brush is densely packed with synthetic bristles that don’t allow makeup to seep in between them, so the makeup ends up on your face, where it belongs. This also means that you’re not wasting product, which ultimately saves money. The handles are flexible with just the right amount of give for the most comfortable application, and the tilted brush tip helps to achieve precision, especially when you’re working the corners of your eyes or applying concealer. The brushes can be used for liquids, creams, and powders, as well as skincare, and because the brushes don’t absorb a lot of product, the brushes are low maintenance and very easy to clean. Each of the brushes included in the Vanity Planet Blend Party Set of 10 Oval Makeup Brushes is incredibly versatile and has multiple uses. To use any of the brushes, dispense your product directly to the bristles and apply onto your skin with a single sweep. Gently buff the product into your skin with a swirling motion until it’s fully blended. Additionally, all of the brushes can be used to apply facial serums, moisturizers, and eye creams – you’ll use less product and it will be penetrated into your skin in seconds. To clean, swirl the brush head of each Vanity Planet Blend Party Set of 10 Oval Makeup Brushes on a bar of white soap or against the palm of your hand with a little baby shampoo. Rinse the head in lukewarm water with the head pointing down, taking care not to get the brush handle too wet. Squeeze out any excess water, reshape bristles to their original shape, and lay flat overnight to dry. Repeat every few weeks. If you have any questions about this product by Vanity Planet, contact us by completing and submitting the form below. If you are looking for a specif part number, please include it with your message. 2 Pounds Brazilian Tumbled Polished Natural Stones Assorted Mix - Large Size - 1.25" to 1.75" - Average 1.5"